The American Society of Anesthesiologists conducts a survey of CA-3's every year about where they are headed after residency. As the academic year starts winding down, it might be helpful to look back to see what last year's graduating class had planned for their post-residency career. The ASA sent a survey to all CA-3's it had on their email list. Out of 1,481 residents in its membership list, it had 1,391 email addresses on file. After they sent out the poll in May 2015, it received responses from only 192 residents or 14%. That is admittedly a very small sample but still the best data that is available. Geographically, the respondents were pretty spread out, with about a third of them from the Northeast, a little less from the South, a fifth from the Midwest, and the rest from the West. About two-thirds of the responses were from men. When the survey was sent out, 97% had confirmed job offers. More than 55% of the residents joined anesthesia groups with partnership tracks while 20% joined groups with no partnership track, 18% are becoming employees of health care organizations, and the rest joined anesthesia staffing companies. The mean starting salary was over $289,000 which was virtually unchanged from 2014. But if you want to make more money, then head West with a reported mean salary of almost $315,000. 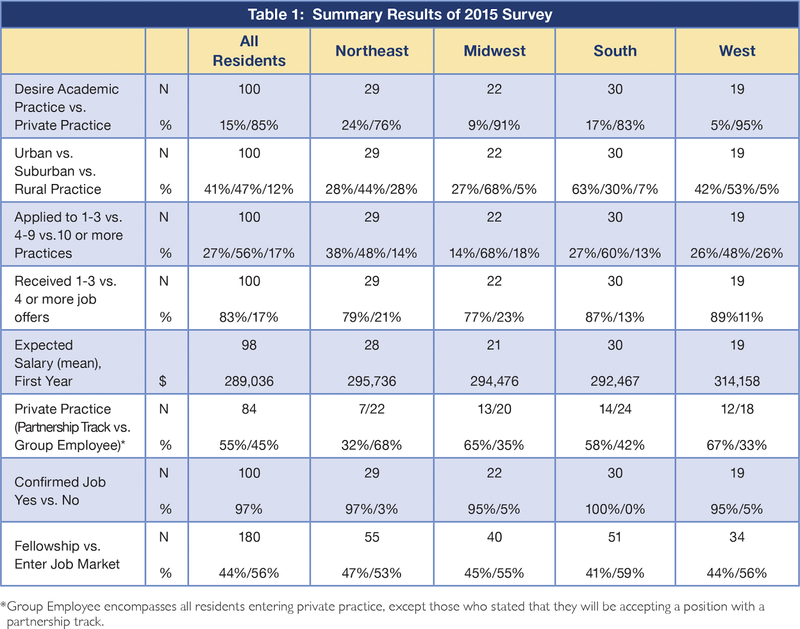 How do residents decide where they want to work? The most common answer was Geography. This was followed by Schedule Flexibility, Job Description, Monetary Compensation, and Call Requirements. Considering all the major changes in the healthcare system right now, Stability of the Hospital System surprisingly ranked last. Those seeking academic careers were more likely to have come from the Northeast, probably since there is a higher concentration of research oriented programs there. In general most CA-3's applied to 4-9 different practices with about twenty percent applying to more then ten. Over 80% received up to three job offers with the rest getting more acceptances. Overall 44% said they were heading for fellowship training. The most popular fellowships, in descending order, are Pediatrics, Cardiothoracic, Critical Care, and Regional. When asked why they were doing fellowships, the most common answers were because they were interested in the field and wanted to learn more about it, and because they felt it would make them more desirable in the job market. "Fellowship not necessary in this market." "Okay, but certainly not flourishing." "Very difficult job market; practice models are mostly employment with very few partnership tracks available; management companies seem to be taking over." "I took a lot less money to supervise fewer CRNA's." "Tighter than most years but improving. National anesthesia companies providing much worse benefits and lifestyle than any other groups." "Get involved in your state society to network. Do your residency in a region you'd like to work. Don't be a complainer or a lazy resident. Work hard and be a team player." That last advice, if followed, will probably give you greater job satisfaction and security than all the fellowship training in the world. Good luck to the class of 2016.